This past Sunday, March 19th, I spent almost two hours observing the bald eagles at Highbanks Metropark. If you'd like to see them, I detail all that you need in this post. Yes, the eagles are far away, but from the platform at highbanks they can easily be observed with a good pair of binoculars. All it takes is a little bit of patience. When I first arrived, the was little activity at the nest. 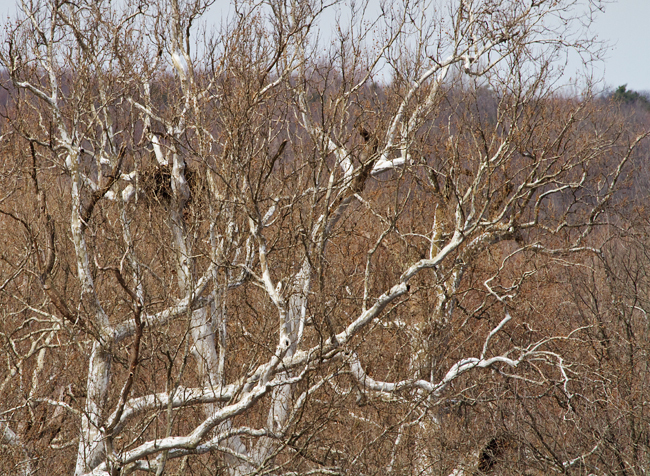 In fact, I wasn't able to tell if an eagle was even in the nest. After a few test shots, I finally did see a white head and a yellow bill resting on the edge of the sticks. About a half hour later, the eagle in the nest emerged. 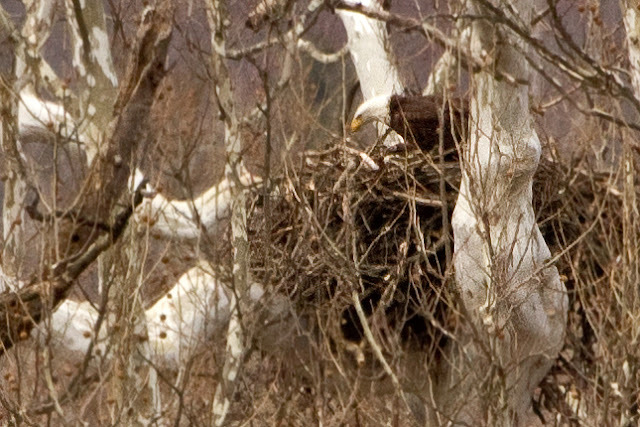 Both the male and female eagles incubate the eggs, and at various times during the day, they switch duty. 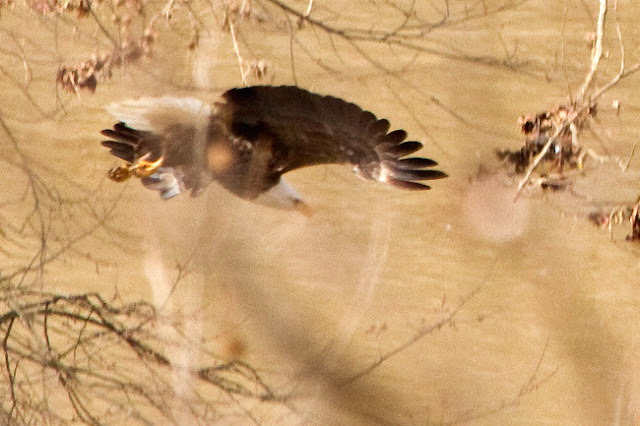 When I first arrived, only one eagle was in the area, but after about an hour, this bird flew up the river corridor from the south and alighted high above the riverbank. By this time, a small crowd had gathered at the platform, and we were ready for some eagle action- they didn't disappoint. This eagle was hungry- it wasn't long before it started diving down towards the river, and then flying back up into the trees with sustenance. Can I capture a meal? Yes, I often think of bald eagles as eating carrion, but this one appeared to capture fish right out of the river- It's possible the fish were already dead, stunned gizzard shad from the recent flooding. Whatever the fish was or how the eagle captured it, it was quite thrilling to watch an eagle obtaining prey above the Olentangy, in the middle of Central Ohio. Although I had to rush back home to help with the kids, I left with a smile on my face after watching our national's symbol soaring around Central Ohio. 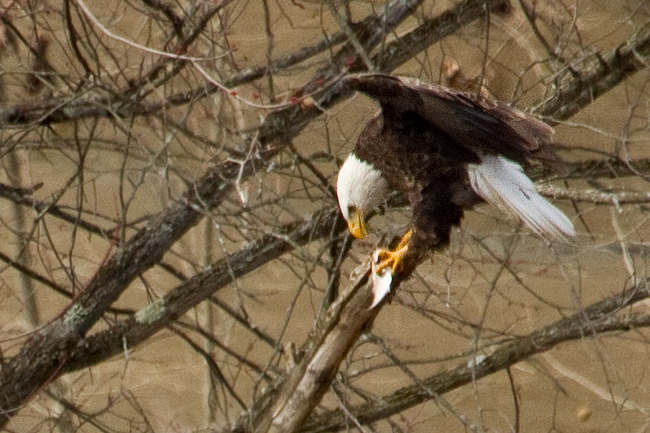 If you would like to see the eagles at Highbanks, I have posted details here. Tom: wonderful captures of the eagle. 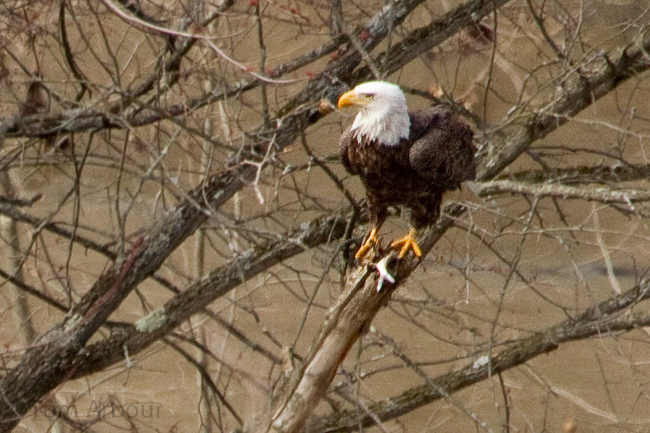 Thanks Tom- These eagles are just really FUN to photograph, even though I'm really far away. HI Tom..wonderful to see...a good catch for the Eagle and a good catch for you!! I really like the first photo...great!! 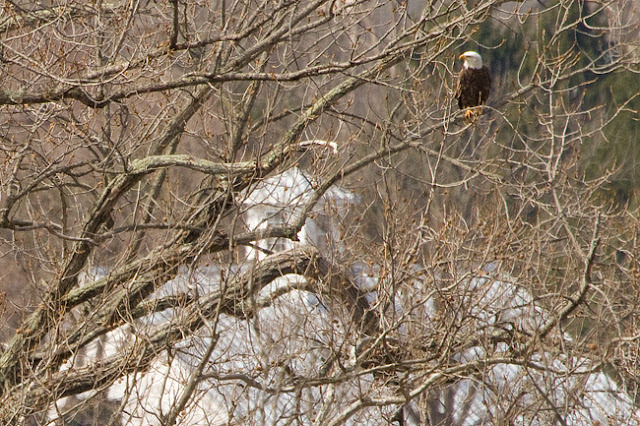 Thanks Grammie- I really enjoyed watching and photographing these eagles. Enjoyed hearing about your eagle observations and seeing the pics. I can imagine how fun it must have been to see the fish plucked out of the river. have you heard anything about the webcam? I can't find any updates. Anon- I haven't heard anything yet. You might try posting a message on the Columbus and Franklin County Metroparks facebook page. Those are nice pictures taken in what sounds like it wasn't the easiest location to shoot. I especially like the one of the eagle air-diving to the water. Just saw an eagle outside of Honda R&D in Raymond, OH.